Geographer, cartographer and map publisher. Native of Denmark, born in Thisted 12/08/1775. His original name was Malte Conrad Bruun. While a student at Copenhagen he made himself famous partly by his verses, but more by the violence of his political pamphleteering; and at length, in 1800, the legal actions which the government authorities had from time to time instituted against him culminated in a sentence of banishment. The principles which he had advocated were those of the French Revolution, and after first seeking asylum in Sweden, he subsequently found his way to Paris in the same year. 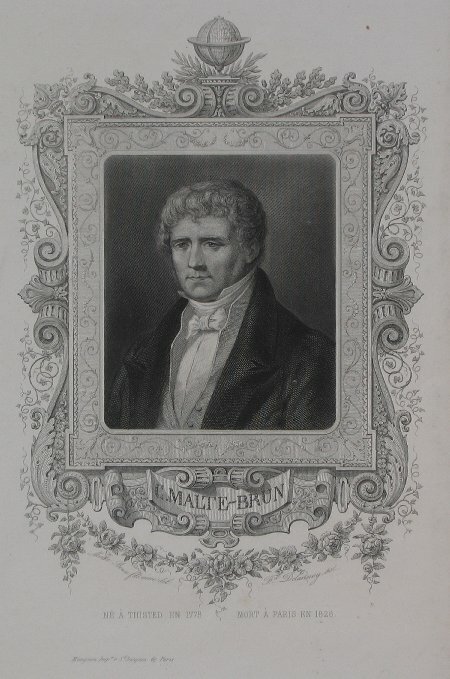 There he looked forward to a political career; but, when Napoleon's political ambitions began to unfold, Malte-Brun turned to cartography and geography for alternative employment and advancement, soon becoming recognised as one of France's foremost geographers. His association with Edme Mentelle [1730-1815] led to the publication of their Géographie Mathématique [Paris 1803-1807, 16 vols]. He is also remembered as the author of six volumes of the learned Précis de la géographie universelle [Paris, 1810-1829], continued by other hands after his death, and of the Atlas Complet [Paris 1812]. Additionally he was the originator of the important Annales des Voyages , and one of the founders of the Geographical Society of Paris. He died in Paris in 1826. His son, Victor-Adolphe Malte-Brun [1816-1889] continued the family interest in mapmaking, publishing a number of maps and atlases in the mid 19th Century period.